Newhampton Road (Cranmer) Wesleyan Church Memorial and Roll of Honour. 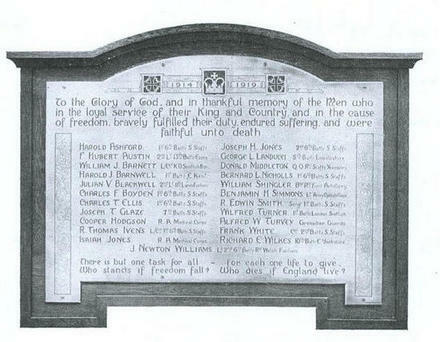 The Memorial Plaque, picture taken from the book "Newhampton Road Wesleyan Church Roll of Honour 1914-1919" published 1920. The plaque was erected in the church. The Church was demolished in 1980 and the plaque was taken down,it's whereabouts are unknown. The memorial is an inscribed brass plate mounted on an oak surround, it was designed by Mr. G. Moore Jr and engraved by Edwards and Ingram. 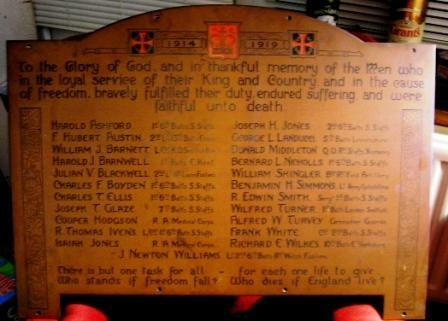 The dedication of the Memorial took place on Sunday 24th October 1920 and was unveiled by W. M. Bayliss JP. The roll of Honour Plaque was erected in the Schoolroom, it was a large brass plaque mounted on oak recording in alphabetical order the 172 names of the men who served during the First World War. It's whereabouts is also unknown. Tim Corbett was looking at this website and read about the memorial's being missing. He contacted his Father who is a member of this church to discuss the memorials and there possible whereabouts. They went looking for them and found both memorial's sitting in a shed on the church site. On Remembrance Sunday this year 13/11/05 a Remembrance Service was held at Cranmer Church and the Memorial was rededicated by the Revd Bill Huband. The memorial will be again on display in the Church for all to see. Thank you to Tim and his Father. 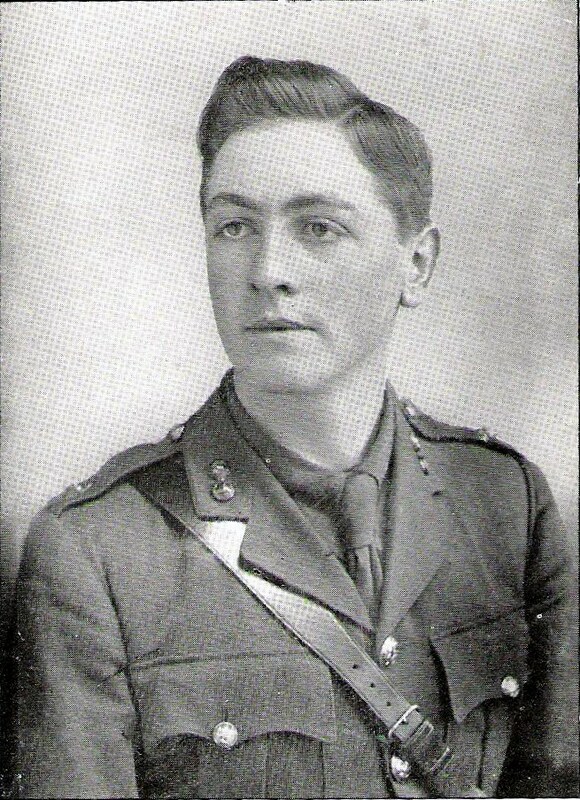 I have been unable to find any reference to Harold on CWGC or on SDGW. In the 1901 census Harold is recorded as being 3 years old and living at 79 Newhampton Rd West with his Mom,Dad,three brothers and two sisters. Only son of Frederick North Austin and Nellie Austin of 2275 Coleman St. Wolverhampton. Educated at Bishop's Stortford and Higher Grade SchoolWolverhampton. Enlisted in Feb 1915 in South Staffordshire Regt. Gazetted 2nd Lt. Feb 1917. Born at Chelmsford. Son of Thomas H. and Fanny Barnett; husband of Elizabeth Barnett of 44 Rugby St.Wolverhampton.Father of eight children. Grave/Memorial Reference: II. G. 18. Killed in Action 11/04/1918 attempting to rush a machine gun emplacement. Son of Julian and Emma Blackwell. Son of James and Sarah Jane Boyden of 162 North St.Wolverhampton. Grave/Memorial Reference: XII. C. 2. Son of Samuel and Mary Elizabeth Ellis of 53 Craddock St. Wolverhampton. Enlisted Sept 1914. Grave/Memorial Reference: I. C. 3. Son of Hannah Glaze of 78 Gatis St. Whitmore Reans Wolverhampton and the late John Glaze. Grave/Memorial Reference: I. C. 2. Grave/Memorial Reference: XXXI. D. 24A. Son of Richard Edmund and Annie Matilda Ivensof 15 Allen Rd. Wolverhampton.Born at West Bromwich. Grave/Memorial Reference: I. F. 9. Grave/Memorial Reference: III. H. 3. Son of Louisa Jones of 182 Leicester St.Wolverhampton and the late George Jones. Son of Alexander and Annie Landucci of 158 Coleman St. Whitmore Reans Wolverhampton. Grave/Memorial Reference: XI. B. 16. Son of William and Lavinia E. Middleton of 20 Newbridge St.Wolverhampton. Son of Lester and Eliza Nicholls of 42 St. Mark St. Wolverhampton. Killed in Action 06/07/1917 Age:22. Killed during a night air raid by bomb concussion,while asleep. Son of Mr. T. W. and Mrs. P. E. Shingler of 80 Riches St. Wolverhampton. Grave/Memorial Reference: II. D. 4. Grave/Memorial Reference: Plot 4. Row C. Grave 12. Son of Edwin and Selina Smith of 33 Walpole St. Wolverhampton. Grave/Memorial Reference: III. D. 16. Son of William Henry and Jennie Turvey of 16 Carter Rd. Wolverhampton. Grave/Memorial Reference: I. H. 23. He served as a sniper. Grave/Memorial Reference: Bay 4 and 5.